The federal government should create a new tax bracket for Canada’s biggest earners as a way to avoid cuts to social spending and "restore fairness to the tax system," a prominent public policy think tank says. 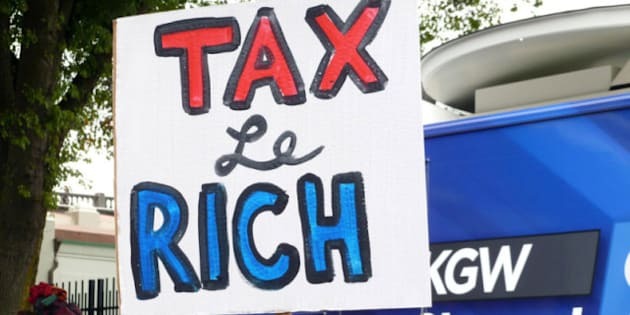 The "alternative federal budget" released by the progressive Canadian Centre for Policy Alternatives on Thursday does away with the Conservative government's spending cuts and replaces them with increased revenue in the form of higher corporate taxes and a new top income tax bracket. The alternative budget would create a top income tax bracket of 35 per cent for people earning over $250,000, and would roll back a series of corporate tax cuts started under the previous Liberal government and continued under the Conservatives that has seen corporations’ federal tax burden drop from 29 per cent to 15 per cent. The alternative budget would raise that to 21 per cent. The CCPA's budget comes two weeks ahead of the release of the Conservative government’s federal budget, on March 29, and is part of an effort by the budget’s authors to make Canada’s tax system more redistributive -- something they say has been lacking from the policies of the governing Conservatives. "The Alternative Federal Budget provides those priorities that are important to Canadians, a national pharmacare program, national subsidized childcare ... It's not a matter of financing it's a matter of political will," senior CCPA economist David MacDonald said. "These cuts that the government [is] suggesting are not necessary. We could go in a very different direction — and it's purely a matter of choice." “The AFB asks Canada’s richest one per cent, who are doing better than they have since the 1920s and whose tax rates are at an 80-year low, to contribute their fair share,” the CCPA stated in a summary of its budget. Many economists have linked Canada’s growing income gap on a steady decrease in the relative tax burden carried by businesses and the wealthy. “Canada could easily raise its federal corporate rate by several percentage points and remain the lowest on the list of G7 countries,” the alternative budget states. Currently, Canada has four federal income tax brackets, compared to six in the United States. The top federal tax rate in the U.S. is 35 per cent; in Canada, it’s 29 per cent. The added revenue the alternative budget would raise would be used, among other things, to fund a job-creation program the budget’s authors say would create 329,000 jobs at its peak and reduce the unemployment rate to 6 per cent. The budget would also restore post-secondary education funding to pre-1992 levels, when funding cutbacks began increasing tuition rates at double the rate of inflation, according to the CCPA. “The middle class is in a slump, young people are struggling to start their lives, infrastructure is crumbling, and concerns about environmental sustainability are brushed off in the rush to sell our natural resources. Canadians need an action plan that wrestles with these big issues and that’s exactly what the Alternative Federal Budget offers,” CCPA Senior Economist Armine Yalnizyan said in a statement. However, even with the higher taxes, the CCPA’s alternative budget still projects larger deficits down the road than the government forecasts. While the Finance Department’s projections show a federal deficit of $31 billion for the 2012-13 fiscal year, dropping to $7.5 billion by 2013-14, the alternative budget forecasts a deficit of $44 billion for 2012-13, dropping to $9 billion by 2013-14. CCPA economist Armine Yalnizyan argued the federal government is "way ahead" of where forecasts predicted Canada would be in reducing the deficit -- somewhere between $6 billion and $8 billion ahead of schedule in this last fiscal year. So the government could balance the books basically without doing anything, just by cashing in on the commodity price boom, Yalnizyan said. The CCPA has been releasing alternative budgets for years as a way of highlighting opposition to government fiscal policy. The March 29 federal budget is expected to double down on the Conservatives’ austerity agenda, with departments being asked to find between 5 and 10 per cent in spending reductions. Many economists and financial institutions -- even those generally supportive of austerity measures -- have suggested Canada is in a strong enough fiscal position not to need drastic budget cuts. Moody’s chief analyst for Canada, Steven Hess, told the Wall Street Journal there is a “risk to growth” if Canada cuts its deficits too deeply and too quickly. The CCPA’s alternative budget agreed with that assessment. “Austerity programs weaken the economy, and their implementation in many European countries has tipped the EU back into recession, fueled unemployment, and increased their debts and deficits,” the CCPA stated in its budget summary. This story has been updated from its original version to include comment from CCPA analysts.